Nothing says summer better than a ripe, juicy tomato fresh from the garden. The store bought varieties just can’t compete. Farmers’ markets agree the tomato keeps them in business throughout the season. The tomato is filled with vitamins and minerals, and is the richest source of lycopene in our diet. This much-needed antioxidant helps fight everything from cancer and heart disease to macular degeneration. 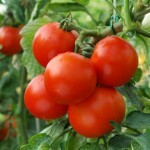 The North Carolina Extension Service growing guide shows an April 20-July 15 planting season for tomatoes in our area. 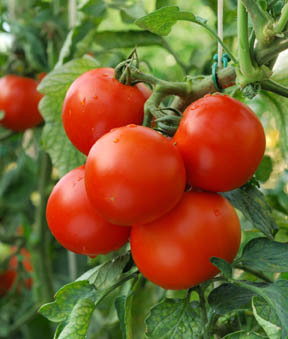 Larger tomatoes prefer nighttime temperatures between 55° and 65° for the fruit to set. Grape and cherry tomatoes are more heat tolerant and stand up to the humidity of the Triangle so they can be planted later. The key to a bountiful tomato harvest in Triangle gardens is to choose varieties that are proven producers for our climate. Time tested ones like Whopper, Better Boy, Celebrity, and Mountain Pride are some of the best selections that stand up to the heat and humidity of our area. But don’t be afraid to experiment with some of the new varieties for 2010 like Marmara with its intense red color and sweet flavor. It’s especially pretty when sliced. Or try the Floralina hybrid developed through a cooperative breeding program with NC State and the University of Florida. With smaller gardens and limited time, many people are growing smaller grape and cherry tomato varieties in pots on their porches and decks. New varieties include Sara’s Galapagos, a small currant tomato packed with sweet flavor, the Red Robin dwarf variety of the cherry tomato that thrives in small pots, and the new Lemon Cherry, a pale yellow with juicy, sweet flavor perfect for snacking or salads. When planting tomatoes in your garden make sure to amend clay and sandy soil with 2-3 inches of organic matter in the top 6-9 inches of soil. Unless you’ve had a soil test done to determine the amount of lime and fertilizer needed in your garden, you can add 3/4 cup of lime and 1/2 cup of 8-8-8 fertilizer to each plant to reduce nutrient imbalances and control blossom end rot on the tomatoes. Space the plants 18 inches to 24 inches apart in each row and place 3 to 4 ft between rows. You will also need tomato cages to support the plants. Tomatoes like water and should be soaked deeply every 7-days, maybe more when the weather is dry. For detailed planting information, disease and insect problems contact your local North Carolina Cooperative Extension office.